Beginning at noon on Saturday, the schedule worked it’s way through two community gardens in South Williamsburg. Berry Street Garden, the first stop, was started by the local community over 35 years ago while The Southside Community Garden, the second garden on the schedule, was only a few years old. 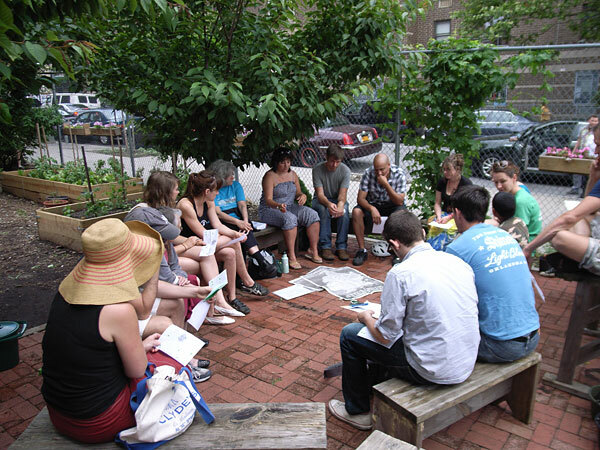 The first discussion concerned community gardens as a commons and was co-organized by Making World Commons Coalition and Occupy Williamsburg members. While the second garden was host to a workshop by 596 Acres, a group dedicated to helping people acquire and develop green community spaces. The schedule then moved over the East River and into the East Village, known to have the highest concentration of community gardens. A childrens’ art making workshop at the Children’s Garden was held in tandem with a swarming for activist workshop at Green Oasis Garden by a member of The Nsumi Collective. The swarming workshop was closely followed by a lip balm making workshop with honey treats also at Green Oasis Garden. The last workshop of the day was held at El Jardin De Paraiso and was about squatting vacant lots with a brief history of green space squatting in the village by members of C (See) Squats’ Museum of Reclaimed Urban Land. As the sunset, the community was invited to join a group of spatial & social practice concerned artist for a night of food, video, live music and conviviality at La Petit Versailles Garden, organize by vizkult. Pingback: Occupy The Land! UnConference (Expanded) | Bureaux.